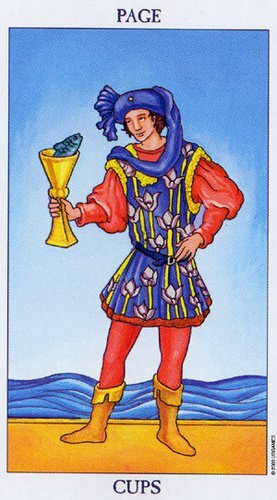 In the Rider Waite Smith deck, a youthful figure is holding a cup in his hand, from which a salmon fish emerges. The youth is wearing a blue hat with veil, the veil is cast aside indicating that he can see the object of his inspiration with clarity. 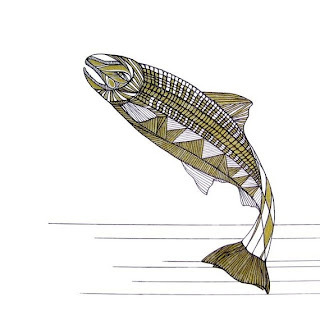 How does the salmon peering from this cup inspire us? According to old Celtic lore, salmon is a sign of sacred wells and healing waters, and its presence symbolized foreknowledge of events. As-if to confirm that we are dealing with emotive and intuitive issues that will not go away by merely ignoring them, we see in the imagery these very waters on the horizon swelling-up, reminding us that we do need to deal with our issues. Issues that reside in the vast world of emotions and/or intuition. If we examine the behaviour of the salmon, we find that we would be hard-pressed to find one more determined to overcome adversities and obstacles. Salmon swims upstream, against the very flow, for approximately 1500 miles, leaping over rapids and through waterfalls in this epic pilgrimage he makes to re-unite himself once again with the sweetly familiar waters of his birth. It is a difficult and treacherous journey, yet this does not discourage salmon or dissuade him from embarking on it. 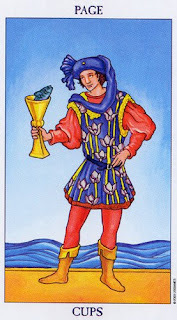 Therefore, when this card appears for us, as it has done today, it might be prudent for us to take a closer look at what our emotions and intuition are trying to tell us. Is there a difficult journey ahead, perhaps one we have been avoiding to take? Daunting as it seems, we need to remember that a journey of a thousand miles begins with one single step in the right direction. What emotional pilgrimage do we need to undertake that will once again reunite us with the sweet healing waters of our origin, our truth? What healing needs to take place on an emotional level? Are we afraid to embark on this journey in pursuit of healing because we fear the obstacles along the way? This card reminds us that we have what it takes to make this pilgrimage, to pursue emotional well-being and balance. It gives us permission to acknowledge that there may be a need for an emotional cleansing and purification, and that what at first appears to be a daunting task is in fact attainable, and may very well be viewed as an adventure of rediscovery of our emotional authenticity. More than attainable, this journey becomes necessary for us to plunge into the emotional rapids, and to face the potential obstacles that may present themselves, if we wish to be emotionally prosperous. For, salmon makes this epic journey in order to ensure his immortality. The waters of his birth calls him into their sweet and comforting folds where he procreates so that his offspring too may be born in the sweet waters of their home-coming, their origin, their authenticity, where the cycle once again repeats itself as the young salmon leave their birthing waters to which they too shall return upon maturity. But, in order to do so they too will embark upon a pilgrimage – as their parents did – in order to continue the cycle. How does this all apply to us and to our self-development and growth you might ask? Here is what I think this card suggests to us. We need to remember our emotional authenticity. Go back to what it is that needs emotional healing within us. We need to revisit the origin of our emotional ills where we will manifest healing. Embarking upon what may appear to be a daunting journey to make our way back, so that we may recapitulate until we reach the point of our dis-ease, so that we may pour healing waters upon it. That moment or event in which our pain and emotional discomfort was born. We may find that the journey in itself is cathartic enough to reawaken our memory of perfection, and in doing so we may discover that the purpose of pain is to encourage us to take this epic journey in which we reassemble ourselves, reminding us that everything is and always has in fact been perfect, exactly as it is. The "pome" part of the word "pomegranate" means either apple or fruit (Old French via Latin). The "granate" part means "with many seeds". A potato in French is called "pomme de terre" (fruit of the earth).